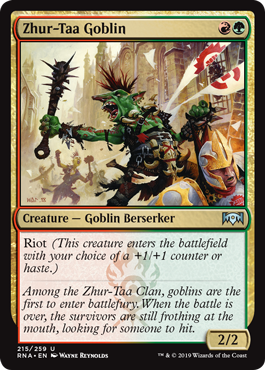 Zhur-Taa Goblin is kind of a Rip-Clan Crasher // Watchwolf split card. Rip-Clan Crasher was never a super successful Constructed card. It was fringe in Alara Block Constructed. Playable, sure; but fringe. 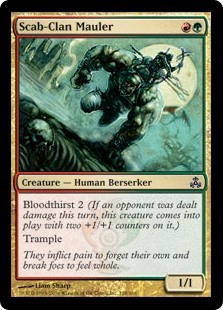 However Rip-Clan Crasher shared not only a Block, but a color combination, with Bloodbraid Elf. 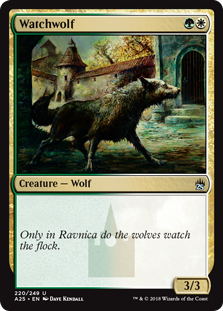 Watchwolf was a tournament Staple in its [original Ravnica: City of Guilds] era. Likely, Watchwolf would be good enough to play today, as well! The Gruul Staple had to bruise the opponent some for its 3/3, instead of living the Hill Giant life on easy mode like Watchwolf. That Zhur-Taa Goblin has a 3/3 mode “for free” is a huge plus for the card. But it’s not just a 3/3… It’s a 2/2 with a +1/+1 counter. That’s generally better than a straight 3/3 due to additional synergies. 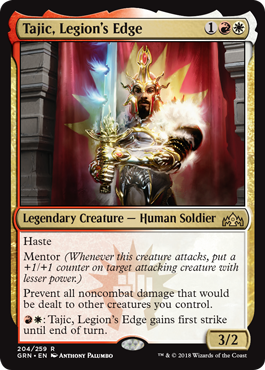 We haven’t seen all the available cards from Ravnica Allegiance, but it’s not out of the question that some +1/+1 synergy along the lines of Hardened Scales might not, um, tip the scales in favor of this card. 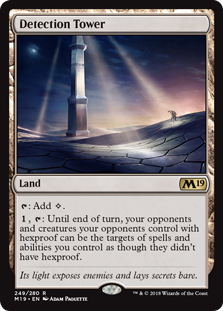 We guess the 3/3 mode will be more popular, but there are many cases where you’ll want to sneak in damage quickly, finish off a Planeswalker, or avoid sorcery speed removal. The hasty mode is great for all that. As such, we expect Zhur-Taa Goblin to be playable in Standard, and have some ideas for Goblin deck mana bases, and brew up some potential homes for hasty Rioters. Check all that out in this bonus episode! 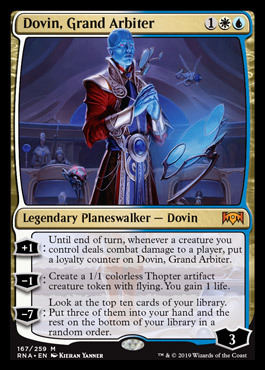 [+1]: Until end of turn, whenever a creature you control deals combat damage to a player, put a loyalty counter on Dovin, Grand Arbiter. Imagine you open on any one mana creature; or even a creature token of some sort… Let’s say Legion’s Landing. Now on turn three, you play Dovin and go [+1]. Dovin’s base loyalty is three. When you plus, it goes to four. Now you attack with all three guys. For one thing, yes, your Legion’s Landing will flip. But what about your Planeswalker? That’s right friend: 4 becomes 7, and out of nowhere, Dovin is already ready for Ultimate! 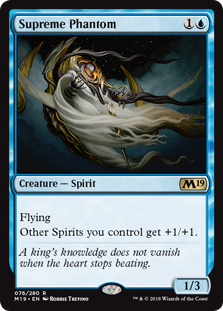 [-1]: Create a 1/1 colorless Thopter artifact creature token with flying. You gain 1 life. While less synergistic than abilities one and three, this might be Dovin’s most important. You get a body. That means that if you didn’t have another one already, this will give you a catalyst for that lethal [+1]. It’s also a blocker. 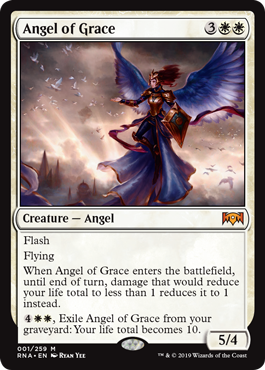 One measure of a Planeswalker is just how well it defends itself. 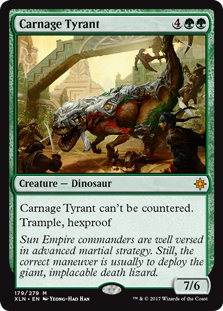 Well, now this one can defend itself for at least a turn or so. The Thopters are artifacts, and therefore friendly with Karn. Likely there is a proactive control deck for Standard that will want both these Planeswalkers. On the simpler side, you can lead up with an AJani’s Pridemate. Now the [-1] will add two power, not one. One 1/1 flyer and one +1/+1 counter. [-7]: Look at the top ten cards of your library. Put three of them into your hand and the rest on the bottom of your library in a random order. Okay, back to seven. How easy was that? The cool thing about this card is not just that it’s so easy to get to seven, but that seven doesn’t come only once. Imagine we had a more realistic mana situation and ran an Ajani’s Pridemate on turn two. You wouldn’t be able to go Ultimate on turn three. That’s okay, though. 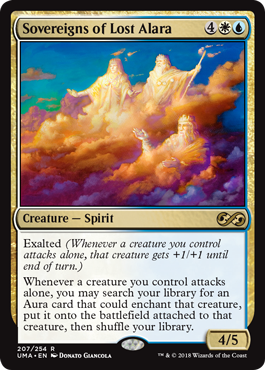 Going to 6 loyalty isn’t the worst; it implies you’ll go over seven next turn. That means getting to use this Ultimate more than once. 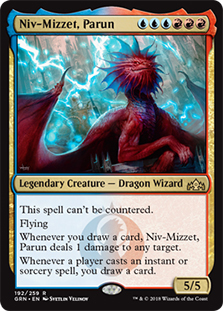 Dovin’s [-7] seems great but isn’t really the kind of Ultimate that wins the game immediately. Good thing it lines up for multiple uses! Dovin might be first this week, but he’s not alone! 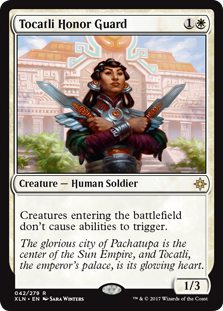 Check out this week’s podcast to hear about more Planeswalkers, more gold cards, and more quick plays, generally; all from Ravnica Allegiance.